I had a wonderful two days off. I read a lot, I wrote a little (probably should have done more of this, but that's how it happened to go) ate good food, and watched DVD's. Today will be cool again, so I will be comfortable at the shop today instead of wilting from the heat, and I need to start thinking seriously now about my trip to the Bead & Button Show next week because I leave in a week and have to be packed and ready to go. This is Sasha Kitty. Isn't she a sweetie? Today I'm on cat care. Chickie is in Seattle visiting her 99-year-old grandfather and her father's relatives as well as some friends, and I'm on Sasha care for the morning and evening today, and the morning on Wednesday and Thursday. 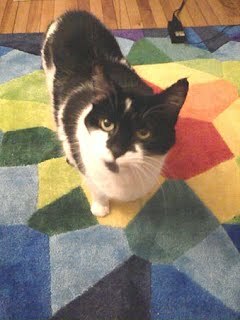 Sasha is a sweetie, a "cow kittie" - black and white - and a rescue. She's fun to take care of and easy. Clean the litter box, feed and water the cat, sometimes place treats out for her and sometimes brush her. She and I have an understanding. I clean her space, she doesn't shed all over me. Although I didn't write a lot over the weekend, what I did write I'm pleased with. I have two stories going right now and both are fairly large. I know I'll have some time to write while I'm in Milwaukee, but I really want both of these farther along by the time I leave, so I need to do some serious work this week. I just couldn't put my NookColor down over the weekend, though. I was reading a great series and just couldn't stop. 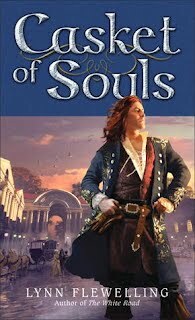 Fortunately I finished the final book yesterday, and today's pre-order of Lynn Flewelling's "Casket of Souls" will be downloaded in the coffee shop while I have my morning coffee, so I'll be head deep in Alec, Seregil and their cronies again. Life is good! Aww, sweet kitty! :) Yep, cat-sitting is much easier (and fun) than baby-sitting. Oh, I make a terrible baby sitter - no patience - LOL. Sasha looks just like lavendertook's kitty "Moo"! Love the name, "Moo". Sasha is pretty fun, but not really a cuddly kitty. I don't mind kitty sitting Sasha, she's actually a sweetie and really appreciates being fed and having her litter box cleaned out. Sometimes she wants attention, most of the time she doesn't. Easy. At least I got a bit of writing done this morning on my Ardor in August piece (and of course several chapters of my new book read - LOL). Birds frighten me, their beaks are vicious. I have pet sat snakes and lizards, dogs and cats, but no birds for this gal. Birds should be flying free to my mind. I met a great cat at my friends' place during their BBQ yesterday. There is a small green field in their apartment complex where they set the grill up, and a tiny black cat came along. The cat was both friendly and observant, and she followed people around like a dog, sometimes coming up to ask for attention but often just watching. She even accompanied two rowdy five-year-olds around the edge of the field for half an hour. Good luck with your writing and packing! Oh sweet! All of the animals I've had in my adult life have been black - three cats and a dog. I wish I could have a furry one now, but I want to travel in a few years for an extended time and it just wouldn't be fair to any pet. I'm glad you've considered the ramifications of your plans for potential four-legged companions. I've sometimes wished for a cat, but with the financial and geographical uncertainly of adult life to date it has never seemed fair to get one. Just love the cat! it is cooler here too, thank Goodness! She is a doll, for sure. It finally cooled off again here so we're back to livable temps for at least the next few days.